Fueron Felices y Comieron Perdices is a metaphor. The literal translation would be: they were happy and they ate partridges, the English equivalent to “they lived happily ever after”. In old times only the “bourgeoisie” could eat partridge meat, in Spain considered one of the most delicious of that kind. In other words in order to be happy you had to be powerful, wealthy and healthy. I guess that is why superficially many fairy tales ended that way, so to give the audience some hope for a better life. Talking from a more pscychological perspective I believe that a happy ending means the solution of a psychic problem between the different components that form the human psyche. 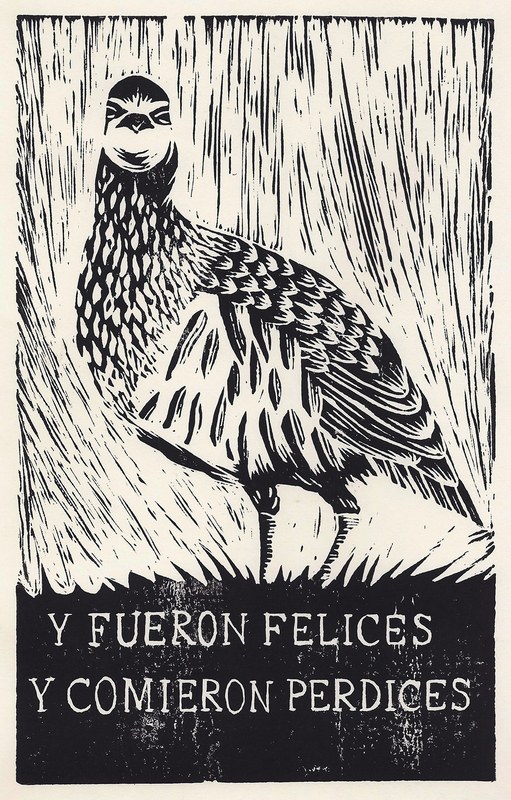 This piece is a hand-printed linocut.